The Daily Roman Missal, Third Edition, durable and beautiful with a deep burgundy padded bonded leather cover and 6 ribbon markers, is both a tool and a treasure for any Catholic who wishes to learn about, love, and live the Mass more fully.The Daily Roman Missal, Third Edition presents the liturgical year's worth of Sacred Scripture, allowing the faithful to follow and delve further into the Church's holy celebration including those for the Sunday liturgies. This new edition is updated with the guidelines of the Bishop's Committee on the Liturgy. All the readings for a day are now contained in each entry, not referenced throughout the volume. Both the long and short forms of readings are printed. Illustrations from illuminated manuscripts grace the pages. The sixteen new saints in the Church's calendar of feast days are added. Relevant passages from the Catechism of the Catholic Church offer an educational perspective on the liturgies for Sundays, feast days, and solemnities. Devotional prayers for before and after Mass have been expanded with new translations more literal and faithful to the Latin originals. Latin translation of the Novus Ordo is included for the mass parts. It does NOT contain the Tridentine Latin Mass. Eucharistic Prayers for Reconciliation I and II are NOT included in this particular version of the Third Revised Daily Roman Missal. Need Help Using Your Missal? Click here for "How To Use The Daily Roman Missal"
Below is an initial "set up" ribbons suggestion. It gives the new user somewhere to start—which can be adjusted as their proficiency develops. Measures 6.75" x 4.5" x 2"
The missal is wonderful. First,it is beautiful. I watched a You Tube video of how to use the missal and it was very helpful. I bought the missal after a parish Lenten mission inspired me to go back to my roots and use my own missal at mass. Lots of great "extras". Bought as a gift and have not given it yet. I am sure it will be loved as she had requested one. Received replacement with no questions asked. Excellent company really stand behind their products. Easy to follow and is the same translation as the mass. I Love this Missal!! I use it daily to read the Mass Readings, The Patron Saints of the Day and devotions to the Holy Spirit. I usually need a large print Bible etc. but the font in this Missal is easily readable. Highly Recommend. Daily Roman Missal - Easy to use; chock full of goodness! This book is so helpful to me! I am a recent convert, so I have a lot to catch up on. It is more pleasant for me to have a book rather than turning on my computer/phone for the daily readings; I can take this to mass and make notes (keep post-its inside). It's easy to use despite the extensive content! Just take a few minutes to find where we are in the liturgical year, remember which color ribbon you used to mark the day's page, and you're good to go. The included prayers are an added bonus. I purchased this as a gift to my grand nephew as he is to be baptized at the Easter Vigil 2018. The missal is beautifully printed and bound, much like the missals of old. The format is Novus Ordo. My only disappointment: the missal should have been properly boxed in order to gift wrap easily. I wanted to examine the missal and skipped the gift wrapping. A simple box around the book would have been appreciated. Great book. Have been enjoying it. So far really like this Missal. Took me a little while to figure it out. Paper pages are too thin. I will have to be careful not to tear them. Miss the Collect, Prayer over the Offerings, Communion Antiphon and Prayer after communion on the daily mass readings. Maybe I just don't know where they are. But I think I will really like this missal once I get used to it. I am enjoying my Missal on both weekdays and Sundays. It is very well presented and organized. Love being able to follow the readings for each Mass and follow the readings for the saints of the day. The Missal also has many of the prayers, devotions, and explanations of the sacraments and church teachings. Highly recommend this Missal. I started using my new Missal the Sunday following it's arrival. I attend Mass often during the week and it's always with me. I keep it in my car so as not to forget it when I arrive at Church. When I could not get to Mass on Christmas Eve, I watched the Papal Mass from the Vatican, 11:30 pm-1:30 am! I followed along with my English/Latin version of the Mass, being Italian I also understood the Italian prayers! The children dressed in native clothing were beautiful as was Baby Jesus! I loved when they brought Him from the altar to the back of the Vatican to the manger with Mary, Joseph, the shepherds and animals with the Angel overhead! Jesus is the reason for the season! The Daily Roman Missal has now become the one book that brings joy and contentment to my daily life. When I was a high school student (1962-1966) I had a _Cathedral Daily Missal_. It, too, was an excellent volume, but the _Daily Roman Missal_ is far superior to any book I have reviewed. If you are considering a missal, this is by far the best choice. This is a wonderful gift for confirmation which will last a lifetime. Great quality. The Catholic Company is a very good company to do business with. They back up everything it sells. The Daily Roman Missal has been such a benefit to my spiritual life! It has helped me dive deeper into the intricacies of the Mass. It has also given me a push to read the Mass Scripture selections before Mass earlier in my day or the night before so as to prepare my heart to receive His word. A grace-filled purchase! I love this missal. It's beautifully made and the personalization/name embossed on the front cover is well worth it. Thank you. My husband ordered me a personalized daily Roman Missal for Christmas. It unfortunately had a damaged back cover. The customer service department replaced it with a new one. It is beautiful. I am impressed with the great customer service of the Catholic Company. Thank you. I love it! The book is perfect! You thought of everything. The ribbons are perfect, there is enough to mark my favorites and everyday gospel. The cover and the gold edges brings beauty to the Lord's prayers. Great Job! I was looking for a missal that I could use daily and in both English and Latin as I go to both types of mass. I love find the bit more formal style of language in the prayers. I have shown and recommended purchase to several staunch Catholic friends. Very pleased with the Missal. Love all the features mentioned. The ribbons are very handy to have. Highly recommend for daily Mass. I totally love it and plan on using it everyday for years to come. Thank you so much! I bought this book for my Dad for his 83rd birthday and he just loves the book. He told me he reads it everyday and gets so much from it. It's a wonderful book and I would recommend it highly. I use it everday and love the rosary reflections. Great item and positive customer service. Having used the Moravian Daily Texts for many years as the basis for my morning devotions I wanted to add something new to supplement those devotions this year, something which would add elements of the Mass. As a Lutheran it took a while to find the Daily Roman Missal. I am thoroughly enjoying this daily addition to my readings. It is a beautiful book and I am very thankful that the church has produced such a wonderful treasure. I hope to use this book the rest of my life. Though a very good missal, I find that there are some disturbing errors. The first page of Table I liturgical calendar starts at 2010 while page 2 starts at 2011. I also found that the readings for 2015 Lenten season are not the ones used by the priest; the ones for 2014 seem to be the correct ones. I find this a very bad error on your part. In 2014 I thought is was just my difficulty learning how to use the missal but now I find that the missal itself is wrong. I could not recommend this book. I could hardly be more pleased. I love the current Sunday Lenten Mass readings and use the daily readings along with the Moravian texts I have used for nearly 30 years. You will not be disappointed if you choose to purchase a copy of this beautiful Missal for your daily devotional. Very nice! I bought it as a gift for my husband. Beautiful!!! I highly recommend this for anyone who wants to grow deeper in their faith. Excellent for either daily mass or for reading the daily gospels. The book is large but I find myself keeping it with me. It is beautifully crafted and well worth having. I bought this missal as a gift for my husband. It is so beautiful!!! I am a daily Mass attendee and the missal provides me with the 'play-by-play' needed to stay involved with the Mass. Easy to read. Easy to follow along with the priest. Nice to have the Latin version right along with the English version as our church offers the Latin Mass once a week! I use this book every chance I get, I love the meditations they provide daily, along with follow at home mass when you are unable to attend services due to illness, you can still follow mass on tv without being lost. I know the book has a lot of great qualities and is a must own for anyone who wishes to grow with Christ and be close to their church again, however I wish they had some hymns included. Exactly what mom wanted! Perfect gift! Mother has repeatedly thanked my sister & I for the birthday/Easter gift of Daily Roman Missal Third Edition! She is a devoted daily mass attendee and when the changes were made and the updated missal version was not yet available for purchase, she was resorting to multiple handouts from the various parishes she attends to follow along. She loved the personalization. Great job! What a Value -- In Substance and Price! 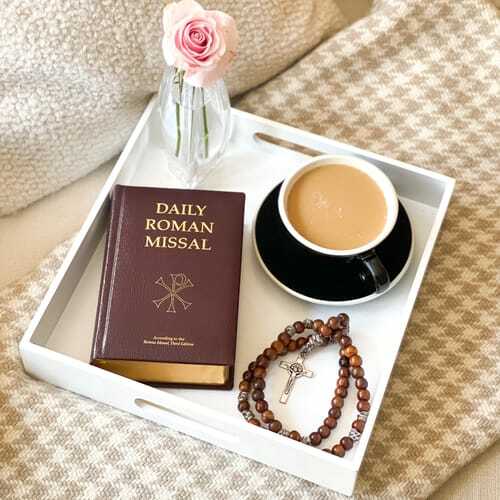 I use the Roman Missal each day at Mass, and find the layout to be extremely helpful (prayers before Mass, after, plus it covers special spiritual events in the life of an individual and family. I value it as I would a precious work of art. Other than the print being a bit small, it is perfect for my liturgical needs. I use this at Mass and is so easy to use and everything is easy to find. I also enjoy the latin pages this is how I remember it from years ago. I also enjoy reading it during the week at home. Highly recommend it. Having only just received my daily Missal, it will take me some time to get used to the layout & find my way around. The type set is very clear. Having 6 ribbon markers does away with the need to use cards, a good thing @ present as, due to new stiffness, it's difficult to insert them between pages. I like the binding & the gold embossing gives it the appearance of something of quality, befitting of a religious publication. I hope it will be with me for years to come - unless another translation is deemed necessary! Beautiful and very complete. Not only does it have the complete Mass but all the prayers that one needs to be a practicing Christian Catholic. I was searching for a new Missal for my wife that included the three year cycle for Sundays, the two year cycle for weekdays and the new Liturgy. When I talked to Catholic Company the women told me this Missal was what I was looking for. That was an understatement! Not only does it contain all I asked about but is absolutly beautiful. I had my wife's name and church embossed in gold leaf, beautiful. The leather cover, the six place keeper ribbons, and the ease of use enhance the joy of participation in the Holy Mass. Using it daily allows you to learn the beauty of God's word. Once you get the lay out down pat, it becomes simpler to use. Perfect for preparing for, participating in, and reflecting upon Mass and the Catholic experience. Bought one for my mother and liked it so much, I bought one for myself. This is an excellent Missal. I enjoy it daily. Use my missal every time I go to church, which is every Sunday and holy days! I like the longer ribbon markers and the print is very easy to read. Wonderful Missal that in my opinion should be refined in the area of locating pages to match the appropriate Mass day and readings. I believe that they should set up a better "date schedule" listing pages to coincide with the date you are looking for. There is confusion in this area, but again a beautiful fine Missal and keepsake. With this I begin my day and end my day..... In a day filled with challenges and self indulgence, I take solace in the fact that Jesus is with me always, today and forever more. Bought this Roman Missal for my husband for a Christmas present. I had it engraved on the leather cover. He was thrilled. It looks so 'rich' and the price was better even with the engraving added than one of the more popular Catholic sites. I felt it was a great deal and my spouse was so pleased! I use the Daily Roman Missal daily for the responses of the congregation and to follow the readings. I like the expanded prayers it has. I have shared them with many people! It has helped to improve my prayer life. A treasure from the Bishop's committee. This was a gift for Christmas 2011.
well worth the price. it will be a joy to use. Missal very professionally done. Beautiful as well as usable. Beautiful outside & inside as well! To quote my son It's awesome! Just what I wanted! I even had people at church oohhing over it. He couldn't be happier with it. It is not as big as I was afraid it would be, even though it has both Sunday and weekday masses, so it fits nicely in my prayer tote. There are prayers, Commandments, examination of conscience in the back and lots of ribbons to mark your special places. I haven't had a chance to look at everything yet, but I am really happy I have this. It was worth the money for me. I USE AT DAILY MASS ITS FULL OF BASIC CATHOLIC LITURGY HAVEN'T FOUND ANYTHING WRONG. I think the Ribbon Markers are too thin. I own the previous edition, and they are much heavier than these. I just hope they hold up with daily use. Other than that the Missal meets my expectations. I will teasure this beautiful missal. This is a MUST Have for the upcoming change in the New Translation of the Mass. I especially love it because it has the Sunday Readings in it also. I never learned Latin. This Missal has the Latin Translation next to the order of mass, which is Great. Now I don't have to worry about the priest asking me to Read during the week,because I now have it at my finger tips. The Con is that it does not come enclosed in a zipped cover, for protection. Other than that I love it. I will also order the Sunday Missal 3rd Edition when it becomes available.